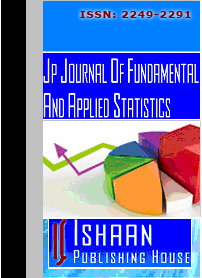 Aims and Scope: The JP Journal of Fundamental and Applied Statistics (hereafter JPFAS) is a peer-reviewed international academic journal having a broader spectrum covering all aspects in the branches of theoretical and applied statistics and publishes high quality original significant research papers and critical survey/expository articles. The prestigious interdisciplinary editorial board reflects the diversity of subjects covered in this journal, including Probability Theory and Distributions, Stochastic Processes, Stochastic Differential Equations, Sampling, Econometrics, Design Experiment, Operations Research, Correlation and Regression Analysis, Bayesian Analysis, Multivariate Analysis, Data Analysis, Descriptive Statistics, Nonparametric, Sequential Analysis, Time Series, Markov Processes, Bootstrap, Statistical Planning, Mathematical Statistics, Biostatistics, Computational Statistics, Statistical Inference & Wavelets and other related topics. It provides authoritative reviews of current developments in different areas of statistics research. Contributions are invited from researchers all over the world. All submitted manuscripts will undergo review process and the publication decision will be adjudged by quality, novelty, suitability and interest. Indexing/Reviewing: Papers appearing in JPFAS will be reviewed/indexed in Mathematical Reviews, MathSciNet, and Zentralblatt für Mathematik databases. Frequency: The JPFAS is currently published in two volumes annually each having two issues appearing in January, April, July and October.